I see you have been recommending that the overwater restaurant at the St. Regis is great to have dinner at one night. We are staying at Le Meridien for a few nights then at the Hilton and were thinking of going for dinner there for a night. Would you suggest going while at Meridien since it's on the same motu? How’s the ambiance and average price for 2 people? What is the name of the restaurant and I guess reservations are needed? What should I know? The over water restaurant at the St Regis is named Lagoon. It's a lovely choice, if you want a really special dining experience, while you're in Bora Bora. The ambiance has a unique elegance. Everything is so classy, with polished wood, gleaming glass and warm lighting. Book ahead for a table outside on the deck. You can sit in the balmy air (as it's over water there's no mosquitoes) and watch the sun set over Bora Bora island. On a clear night the moon bounces it's light across the lagoon and outlines Mt Otemanu. The St Regis and Le Meridien are both on the coral motus which ring the lagoon. The protocol for booking dinner at Lagoon is that you ask your concierge to make a reservation. Your concierge will clarify shuttle times. You will need to take the Le Meridien shuttle to it's mainland dock and then (unless it's hot) walk (you only want flat sandals or quality flip-flops in Bora Bora) or taxi to the St Regis mainland dock. The two docks are located only a few minutes apart. You will want to catch the 5pm St Regis shuttle across to the hotel. If you are intending to walk back on your return trip, it's useful to take a torch as the Circle Island road is not brightly lit. If you are very, very lucky, and it's not busy, the concierge may be able to arrange for the shuttle boat to drop you directly at the other resort. The St Regis and Le Meridien are part of the same hotel alliance. We love the friendly island atmosphere at Le Meridien. St Regis has quite a different style so have a stroll around and enjoy a cocktail in it's stunning bar (which opens at 5pm). 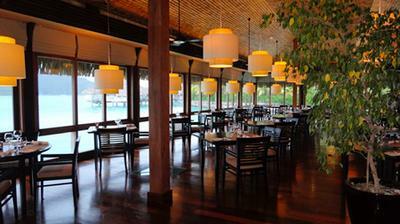 Lagoon is one of the most pricey restaurant in Bora Bora, but you will have a memorable experience. Appetisers are around $35. Entrees/mains cost from $44 to $60, and deserts are about $22. While you are at the Hilton you might enjoy visiting the Yacht Club (it's near Vaitape) for a very delicious, casual lunch or dinner. Having a drink or a meal in the friendly waterside atmosphere is one of the best things to do in Bora Bora. Wow! I am sure that overwater restaurant is a really nice idea. I'd like to eat there. Your site contains so many different cool ideas about spending time on Bora Bora. Please keep it good posting. From now I am a big fan of this site. You are one very reliable blog writer. My partner and i find your blog really interesting. Can you give me some idea of dinner cost at the restaurants and swim up bar at the St. Regis resort in Bora Bora? Also, is there a market close to that resort? My fiance and I will be spending 7 nights at the Pearl Resort from May 22 to 29. We have breakfast as part of our room and chose not to take the meal plan. We have mostly unplanned late afternoons and evenings and two activities that include lunch. Our first day is open and we were going to find a supermarket for some snacks and, hopefully, some alcohol in Papeete. Do you have recommendations for dinners and other meals? We chose not to take a meal plan as we were told we can go to restaurants and not spend too much more. Do you agree? Do you recommend places we can eat out and not overspend for food? Thank you so much. I enjoy your site very much and am really looking forward to my trip. Very clever to have included breakfast. Buying it ahead you will really get your money's worth and you can eat up big to last you through the day. You will have a wonderful time shopping at one of the Carrefour supermarkets in Papeete. They have an amazing array of delicacies and alcohol. But remember that Air Tahiti is strict about your 20 kilo bag weight and 5 kilos of hand luggage on flights to Bora Bora. While planning your week, remember that you will be on a gorgeous motu, so each time you want to go out you will have to time it with the resort's shuttle boat and pay for the resort's bus service to Vaitape or get a taxi straight from the pier to your destination. As the Pearl Beach resort is very beautiful you will want to ensure that you allocate plenty of time to just relaxing there. We suggest that on one of your first days in Bora Bora you visit Chin Lee's market in Vaitape (take some carry bags) and stock up on snacks. There's tasty cooked meats and seafood available too. You will also find very cheap water and some alcohol there. The newly restored Yacht Club has very fresh delicious food and makes heavenly Pina Colada's with freshly squeezed coconut milk. It's right on the water and the service is special. Tell Julien we sent you. It's great for lunch or dinner and there's music in the evenings. It is also a great spot to watch the sun set over the water. If you want a taste of local life go to the Fare Manuia which has a varied menu (including wood fired pizza) and good pricing. For budget Bora Bora eating quaint Roulette Matira is almost across the road with yummy food and very friendly service. These can be combined with a visit to legendary Matira Beach. Snack Matira, further along the Circle island Road towards Vaitape, is also very popular. For a very special, splurge night out we recommend getting the concierge to make reservations at the Lagoon Restaurant at the St Regis. This stunning restaurant and bar is set over the water and has a famous French Chef. It's also a chance to look around this resort. Or book ahead of time (ie now)for the table up the top at the Villa Mahana (also French) which has an incredible atmosphere and arguably the best food in Bora Bora. Practically everyone goes to the feet-in-the-sand Kaina Hut which has good food at typical Bora Bora restaurant prices. The Aloe Cafe in Vaitape (across and up the road from Chin's market) has great value for Bora Bora, simple, local cuisine like hamburgers and milkshakes and is open for lunch. We are pleased that you are finding our site valuable. You will have a memorable holiday so if you want to share some of your experiences, we will be thrilled to hear some of the highlights. My wife and I are planing our first trip to Bora Bora in May 2013. We are wanting to get an idea of how much we should plan on spending on meals? Our hotel doesn't included any meals or drinks. How much can I expect to spend per day per meal? Breakfast buffet is around $35/person. Each resort's buffet varies in price and selection of food. For example, the Intercontinental Thalasso buffet has such an amazing assortment of tropical fruits, fresh baked bread and pastries, crepes cooked to order, sushi, egg station, and all kinds of other delicacies and treats that you will be so satisfied you won't want to eat again until dinner time! Expect to pay between $20-$35 per meal for lunch at your resort. Some lagoon excursions include a picnic lunch or tropical fruit snack, so you will not need to buy lunch every day. If you are on the main island there is a choice of places to eat cheaper than your resort. You may find that two meals a day will be enough in the warm, humid climate. It seems to suppress the appetite a bit! Dinner at your resort will depend on what you choose. Starters are around $15-$30. Entrees (mains) from $25-$50. Most resorts have 2 or more restaurants. Usually there's a casual dining restaurant with a broad menu and more affordable prices and a more formal restaurant with gourmet food and higher prices. If you are wanting to have a special night out here are the best fine dining restaurants in Bora Bora. Drinks are what will really start adding to your dining bill. A bottle of water for the table will cost around $7. During the day water will often be available from the resort's gift shop for a slightly better price. Happy hour drinks will save you a lot on alcohol costs. Often it is 2 for 1 drinks. If you are staying at the Intercontinental Le Moana or the Sofitel, you can walk to a mini mart and purchase snacks and water for a fraction of the cost. If you are at a resort on one of the outer motus, you might want to stop at Chin Lee's market in Vaitape, on one of your first days, to pick up some alcohol, drinks and snacks to take back to your resort. I would say a budget of $130/day for food for breakfast and dinner for 2 people is a good estimation. And then drinks on top of that. Most resorts offer a half board (breakfast and dinner) meal package. You can even email to ask the cost of a half board meal plan because you can save money buying that even if it is not included in your original hotel booking. Usually with half board dinner consists of a starter and entree or a entree and dessert. The half board option will give you more food. So do the calculation to decide if it is worth buying. my other question is transportation airport to hotel. We will stay at the Bora Bora Pearl Beach Resort. How to get from the airport to the hotel and how much it is and that how do you get around the island? and is $1 American dollar XPF 100? We are having 2 days in Papeete, then off to Bora Bora for 6 days at the Le Meridian. Do you have any favourite restaurants there? If you want to splurge you can go to the St Regis for dinner at their famous "lagoon" restaurant. The St Regis is easy for you to get to as they are part of the Starwood hotel group - the same as the Le Meridien. You can even arrange to be picked up from the Le Meridian and dropped off at the St Regis dock. 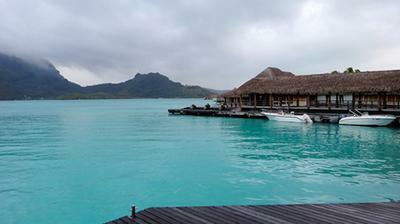 The other place I recommend is the Bora Bora Yacht club on the main island of Bora Bora. Tell Julien we sent you and ask him to make you his amazing pina colada with freshly squeezed coconut milk. Their Mahi Mahi Burger is delicious, as is their trilogy of Tahitian fish. It's the freshest fish you can get on the island as the fishing boats drop it right off to them every day. I would also recommend taking a stroll down the motu to the Intercontinental Thalasso and trying their Deep Ocean Spa facilities. It is the only spa like it in the world. Is the famous Bloody Mary restaurant worth it? Is it suitable for lunch? We have a meal plan, breakfast and dinner at the Hilton Resort. We are wondering if we should plan to go on the island every lunch, where we should go and how to get there? Everyone talks about the Bloody Mary restaurant? Is it worth it? Or it is just a tourist trap? Should we go for lunch? We also read what you wrote about the yacht club and will probably want to stop for lunch while on our bike tour around the island. Is that a good plan? I am told it is very expensive for transportation from the resort to town. Can you offer some suggestions to lower that cost? Thanks for your invaluable help and tips! You will find that most days you will be very happy with just breakfast and dinner. The warmer weather and relaxing days make lunch usually not needed! The amount of food that is included for breakfast and dinner is very generous too, so you can really fill up on those. You might have the occasional snack around lunch time, but you wont need to go to the main island each day to have lunch. And some days you might take a lagoon excursion where they provide a picnic lunch or snack. Make sure you book for having dinner at the Polynesian restaurant at the Hilton. It is included in your meal plan, you just have to make a reservation because they have limited numbers of tables. We found this restaurant to be our favorite food at the Hilton. The trio Polynesian starters served in coconut shells is delicious. We were always full from that and had barely any room left for the main course that followed! If you were going to have a meal at Bloody Mary's I would say to go at dinner time. It is dinner that they put out the large display of food that people love to see. However, I would personally have dinner at the Hilton since it is included for you. Lunch at the Yacht club will be lovely. They have the freshest fish and tastiest cocktails. That is a great idea to stop there for lunch one day. Are you very good and fit bike riders? If you really want to see the island by bike, I suggest you hire one of the electric bikes. The first time we circled the island we hired a car for 4 hours, and barely managed to see everything and stop along the way where we wanted to stop. We missed some things at the end having to rush back before they closed. Transport from the Hilton to town is not expensive. From memory it is about $6 each way during the day. The shuttle boat drops you off at the main town of Vaitape. There are a few shops and restaurants there. If you want to go to Matira beach where there are some more restaurants, taxi to that part of the island is very cheap. Usually $5 per person each way. A well priced place to have a casual lunch if you are in the main town of Vaitape is the Aloe Cafe. From where the Hilton drops you off, walk to the left, and it is a bit further down on the lagoon side of the island, in a little shopping complex. Also restaurants offer free pick up and drop off if you book ahead. So you can have free transport to any of the restaurants you may want to visit, including the Yacht club. Enjoy your time in Paradise! Let us know your vacation experience after you get back! We would love to hear any tips you have for other travellers.